My strategy managed to overcome a rocky start to finish the month with a near breakeven result. QB Pro’s total return for December was a loss of 1.56%. That would have been a positive number had I not switched servers at an inopportune time. The system had its best day when I switched and, of course, I forgot to flip the “on” switch overnight. I missed the most profitable day of the month. 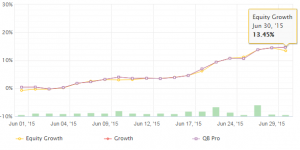 Equity curve of QB Pro from Dec. 1-31, 2015. 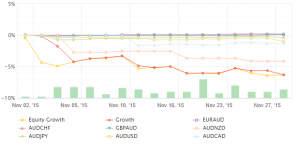 The portfolio on December 1 included a mix of both CAD and CHF. As you can see, the month started close to something of a nose dive. Everything through Dec. 9 was harrowing. Not coincidentally, that was also the day that I removed CHF from the portfolio. Ever since Dec 10, you can see that the equity curve has more or less marched straight upward. I’m only trading CAD crosses at the moment and intend to keep it that way. While I’m tempted to up the leverage, I plan to wait for at least a week. The first few trading days of the month always seem to be the most volatile, which is rarely a good thing for me. There’s not much else to write about. I feel like I’m dialed in right now. The only thing to do now is sit back and wait. QB Pro return -6.59% for November. My goal of hopping on board the commodity trends was late to the party. 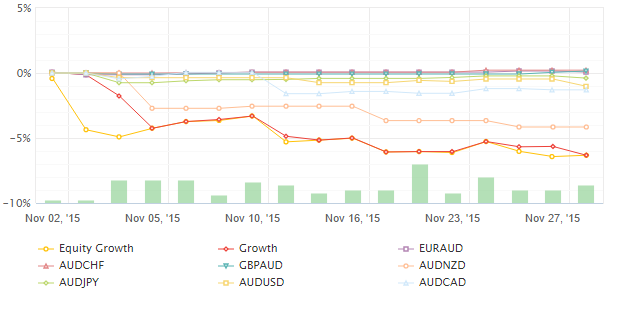 Starting October 1, QB Pro traded a mix of AUD, CAD and NZD. That portfolio mix resulted in losses because those currencies have remained range bound from October until today. Although QB Pro is a mean reversion strategy on the H1 charts, its performance depends massively on long term trends. My biggest challenge on the first of every month is to make sure that my portfolio allocation makes sense for the current environment. CAD is still near the upper end of where the current trend peaked. I see no fundamental or technical reason why the CAD trend is topped out. Yes, I may need to sit through some minor up and down months; the price might consolidate around 1.30 to 1.33. Then again, it might start zooming upward again. Whenever the trend resumes, I fully expect CAD to continue its trend in the same direction. The strongest trend in the market right now is CHF weakness. There are plenty of fundamental reasons to dislike CHF. An interest rate of -0.75% is chief among them. But… that’s also old news. Nothing on CHF fundamental front has changed. I feel like I’m rationalizing, so I’m just going to skip the analysis and go with what the chart says. The USDCHF is trending up and, as of a few days ago, broke through the previous high before the collapse of the EURCHF peg. Recent backtests of the QB Pro system on a CHF portfolio look excellent. The backtest below only covers the most recent 3 months. QB Pro equity curve for CHF since September 1, 2015. I feel like we’re in a good position portfolio-wise. This is not an empirical observation. It’s more of a feeling. It feels like my likely downside is limited, that if I do lose, it’ll be small. And if I do win, that it’ll look a lot like my earlier winning streak. If you signed up for the QB Pro system on SeerHub, your portfolio will be automatically updated. We ended the month in the black with a 0.74% return. I realize that nobody is jumping up and down with that kind of performance, but I’m honestly very excited to see the change. At the beginning of October, I made a substantial change to the portfolio. Previously I attempted to pick pairs that were doing well. This approach was something of a mixed bag. While some periods of performance were quite nice, such as June of this year, the month of August was pretty harsh on the portfolio. I also didn’t like that the pair selection process was still very subjective. The QB Pro strategy, like any strategy, makes its most important trading decisions when it selects its portfolio. The strategy is not one that can make money in any given environment. Instead, it requires careful selection of instruments in order to give itself the best possible opportunity to earn a profit. The equity curve for the month of October 2015. Based on about 100 hours of research with Jingwei back in September, I’ve been able to reduce the amount of discretion when selecting portfolio instruments. For example, the mega-monster performance from August 2014-March 2015 was driven exclusively by the strength of the US dollar. As anyone who buys gasoline for their car knows, the trend shifted this year out of currencies and into commodities. Specifically, commodities have taken a real beating. China’s economy is sputtering, the US like it’s unable to raise interest rates and most industries suffer from serious gluts. Oil production in the US is widely rumored to possess a severe over-capacity, as evidenced by all the junk-debt ratings on US drillers. Gold mining stocks around the world have been the red-headed stepchild of financial markets, trading at PE ratios as low as 1.0. That weakness spread to commodity currencies, even major currencies like AUD, CAD and NZD. As I ran backtests using a portfolios of those currencies and their crosses, I noticed that the equity curve more less marched straight up through the summer. More importantly, that basket of pairs benefited from the Chinese devaluation, whereas my custom basket took a step drawdown. I’m expecting more problems of out both China and the US through the rest of the year. Although China managed to settle down after the summer, the problems plaguing it are anything but fixed. Recent bankruptcies and bailout of state owned firms point to more cockroaches. And, you know the rule about cockroaches. Where there’s one, there’s 10 more. I expect more Chinese devaluation to follow. Lifetime equity curve of QB Pro’s high-risk version. The commodity currency exposure is an indirect, systematic play on this expectation. The portfolio has done well in the current environment and, given that I don’t expect any improvement at all in China, should continue to do well. The other variable is the Fed. I had the rather unfortunate luck of launching the portfolio just in time for a Fed governor to cast doubt on any US interest rate hikes this year. The change got off on the wrong foot. But QB Pro didn’t just stem the losses. It bounced off the equity low and marched upward in nearly a straight line for the rest of the month. The Fed meeting in October forced the governors to pretend as though a 2015 rate hike is on the table. There’s always the chance that the Fed might hike rates just to prove a point. They’ve been talking about this for 9 months now. The futures market at one point put the odds somewhere near 67% for a 2015 rate hike. Prior to the meeting, those expectations fell under 25%, then jumped back to around 50%. Even if the Fed did raise rates, I see an impossibly low probability of a sustained program of rate hikes. The data looks like a car sputtering on fumes. There’s deflation everywhere expect for the financial markets and beef, where “investors” have been encouraged to park their money in junk debt in exchange for a pitiful 4-5% yield. The economy is sick. The idea of consumers breaking out their wallets and spending like the drunken sailors of 2007 is laughable. My expectation for the next 6-24 months is that the Fed slowly retreats from talk of hiking rates and into another round of QE. That will mark the final admission that the Keynesian policies aren’t working and where the markets lose all confidence in central banks. A confidence collapse would slam currency markets, but it should exercise the most severe impact on the commodity currencies that my traders and I focus on with QB Pro. The deflation would press prices even further to the downside, which provides ideal conditions for this type of strategy. I’m hosting a webinar on November 12 to teach you as much as I can about algorithmic trading. The webinar is going to cover in detail the QB Pro strategy, especially the SB score. I’m also planning to discuss the Fed and Chinese situation in more detail, as these are the two most important factors for us to consider when applying strategies. Make sure to sign up to the newsletter to be notified when I start accepting registrations. This is also open to traders in the United States, which is a big change from previous options! If you’re interested in trading the QB Pro strategy in your own account, attending the webinar will be mandatory. And as a thank you for spending 45 minutes of your day learning from me, you’ll be given a strong financial incentive to trade QB Pro. More details to come soon, so make sure that you subscribe to the newsletter now before you forget. Back in the black! The return for the month was 1.03%. It’s not a huge gain, I concede, but a win is a win. Performance didn’t really go anywhere this month. We floated 2% above and 2% below zero most of the time. QB Yen came in again at a minor loss -0.61%. I’m a bit disappointed with the QB Yen performance so far. Nothing seems wrong other than bad timing turning it on on my part. It’s still hard to take it on the chin for 5 months running, though. I manually hedged the portfolio earlier this month by buying USDCNH in a pullback from of all the chaos. The portfolio took it hard when the yuan was loosened up. I figured that any further volatility would likely stem from USDCNH weakness. The Chinese are actively intervening in their currency. As we all know from the GBP in the 1990s and the CHF this year, interventions work until they don’t. The main point of concern for me is the rollover cost. It is quite expensive to maintain the position. The thing that makes me comfortable with that trade is that there is no chance of China miraculously healing. It’s in debt up to its eyeballs – everything from corporates all the way up to regional governments. And while China doesn’t want the yuan to devalue too quickly, the absolute last thing it would want is for the yuan to rise in value. I cannot conceive of any plausible scenario where China manages to return to the 7-10% annual GDP growth that it experienced for 30 years. Too hot, too fast. If you have a plausible scenario in mind, then write your ideas in the comments section. I’ve promised many updates to the strategy over the past 6 months. Jingwei and I have evaluated them all. All of the proposed changes came up far short of my expectations and were thus not implemented in the live account. I’m working with Jingwei, our actuary, to develop new trading systems. You’re going to learn the newest indicator in a few months. The changes alluded to in the post are all different from QB Pro. I’ve flogged that strategy about as much as I can. I feel good about QB Pro long term. Before anything potentially good happens in the account, however, I really need the Fed to get off the bench. Raising rates would be good for us because it should kick off a long term USD trend. Another round of QE would be the best thing for the strategy. I personally despise QE and think it’s a bad idea, but it would ignite a massive USD selloff. That’s the kind of market where QB Pro has done extraordinarily well in the past. 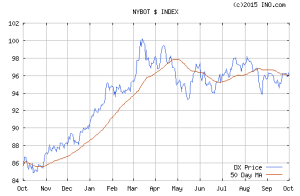 The US dollar index for the past year. And for easy comparison, here’s the same QB Pro lifetime equity chart. Notice that performance peaked around mid-March and has been flat ever since. Things should pick back up whenever the dollar picks a direction. I expect that to happen by year’s end. Nobody will believe the Fed if they punt one more time on a rate increase in December. In the meantime, all of this research has given me the great epiphany that the strategy works best where pairs are trending. The portfolio is being rebalanced this month accordingly. The performance for July brought a modest increase of 2.27%. It’s the summer, so things are unfortunately rather quiet in the market. QB Pro Original drove most of the portfolio increase in June. Things fell flat this month as the strategy brought in a portfolio return of 1.33%. As I already knew, QB Yen is more volatile due to the smaller number of pairs that it trades (only 3 at the moment). The good news is that it contributed to the performance, returning 0.94%. How can I change the portfolio allocation between the two strategies? How can I systematize pair selection instead of manually picking? How are trading costs weighing on performance? Does trading with limit order helps the long term returns? I can’t promise a timeline on this. The research comes when I have an answer. But I am working very hard on it! I’m also excited to announce that QB Pro has received a $200,000 allocation from a fund out of northern Europe. Although it’s not a huge amount of money, the system is starting to manage much more substantial assets than the $2,000 account that I started with at the end of last year. You’ll recall the drawdown that began at the end of March this year. That coincided with major shifts in every currency pair in the portfolio. It was an unpleasant experience to say the least. The shifting appears to be over with. We can get back to the strong trends that the strategy thrives on. QB Pro finished the month up 13.6%. I project things to get better now that the markets are strongly trending. They’ve again picked a direction and really stuck to it. The changes made last month paid off. The signal to noise ratio kept us out of some losing trades. The core QB Pro strategy, depicted in this graph from Myfxbook, shows that it’s clearly tracking well under the current market conditions. The QB Yen strategy posted a minor loss. The performance doesn’t discourage me at all. That said, the numbers are telling me that I overweighted the trending component this month. I’m going to put more of the portfolio weight back into QB Pro and take it away from QB Yen. There are two things that I love about the trending strategy. Things are looking great. I’m going to keep the maximum leverage in place at 35:1 on the expectation of similar future performance. Now that things are back on track, I’m planning to open QB Pro to new traders in July. Why should you consider joining QB Pro? You are willing to risk your money. You face the very real possibility of loss. QB Pro is open to everyone except US residents and citizens. If you’re not on my mailing list, make sure that you register so that you’ll receive updates when slots for QB Pro open. April and May were a real swift kick in the teeth. There’s no hiding around the fact that the market wasn’t very nice to me or my trading accounts. The vast majority of pairs in the portfolio blew out into major trends. That is bad news for a mean reversion strategy. When one currency trends, there are usually a handful bouncing around the mean. It gives us a chance to offset the losses. That didn’t happen recently, which is why my traders and I had a rough go of it. Last month was bad enough that I completely ceased trading for two weeks. After turning the system back on in the second week of May, QB Pro continued to endure minor losses. That was thanks to one of the best trading decisions that I’ve made in the past year, which was to dramatically reduce the leverage. The high risk account took a 6.2% loss. That would be very troublesome on a normal leverage account, but it’s a drop in the bucket by high risk standards. I look at it as more or less breaking even. As a sign of my increased confidence, I increased my total deposits to $7,500 across the two accounts. As of today, the high risk account is back to trading on 20:1 leverage. It was at 5:1 for the past few weeks. 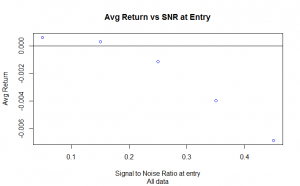 The signal to noise ratio contains enormous predictive power for my trades. 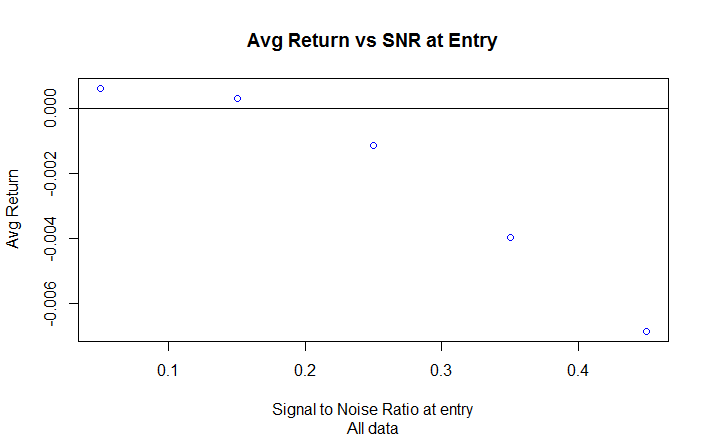 I asked the question, “Does the signal to noise ratio at the time of entry predict the outcome of my QB Pro signals. The first two dots to the left represent 82.62% of all the QB Pro signals. That’s the reason that the strategy makes money. I use 1/2π as the barrier between a range and trend. When the SNR < 1/2π, the profit factor is 1.5 (very profitable). When the SNR > 1/2π, the profit factor drops to an atrocious 0.62. Conclusion: only take trades if the SNR is in the good area. That’s exactly what the updated strategy is doing as of last Friday. Based in part on experience and largely based on statistical analysis, I found a way to bend QB Pro into a historically profitable trending system on yen crosses. I’m sort of rushing this out the door because the market conditions are favorable. The accounts are trading USDJPY, EURJPY and GBPJPY on 1/3 of the overall portfolio. Perhaps I’m tapped out on the creativity front, but I’m calling this sub-strategy QB Yen. Here’s a screenshot of the equity curve for USDJPY in MetaTrader. This was part of my quality control analysis to ensure that the signals generated at the proper times. 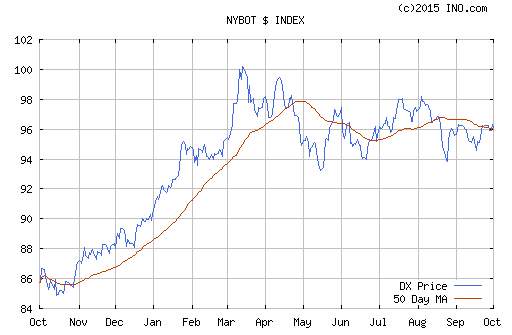 I eventually want to analyze whether QB Yen can tolerate the spread costs of more exotic crosses like CADJPY. Until then, heavy weights will go on the most liquid yen crosses until it looks like they can handle the higher costs of the more exotic pairs. QB Pro historically wins in 2 out of every 3 months. I don’t have enough data to judge whether consecutive losing months are dependent or independent, but it’s only happened twice historically where the system lost 3 months in a row. It’s never lost more than 3 consecutive months going all the way back to 2008. Based on the new changes, the changing market conditions and the historical analysis of drawdowns, I feel much more comfortable putting more money into the account. For those of you that decided to take a break, I personally believe that the worst is over. The market will of course be the judge of that. There is clearly something going on with the current market conditions. Literally every currency pair is blowing out into a single direction. The addition of the recent pairs hasn’t done anything to stop it. Rather than trying to fight this and hope and hope, it’s best to take a time out and see where the chips fall. I did spot a few issues with my long term trend direction that would have made this pain less bad – there is at least a small improvement that will come out of this. That said, the mantra for now is live to fight another day. It’s clear that the market conditions are beating the snot out QB Pro. I’m going to make the hard decision, which is to go flat and do nothing. This is exactly the reason that I don’t charge management fees – I’d feel awful trying to charge people for this recent performance. I’ll update everyone in a week or two when we’re ready to evaluate whether or not to flip the switch back on. It’s been a bumpy month by any definition. We made a ton of money in the aftermath of last month’s Fed announcement, only to give it all back the next week. QB Pro recovered most of the earlier gains, then last week’s drawdown took it all back again. It’s been painful. The good news is that the new changes to QB Pro are rolled out. Several of you sent in emails asking about new currencies like GBPNZD and AUDCAD appearing in your account. Kudos to you for paying close attention to the trading. The total currencies traded in the basket is up to 16 pairs. While the max leverage is unchanged at 36:1 (still very, very high), the leverage per pair is only 2.25:1. Future losses like the one from last week will still occur. The difference is that the size of the positions is reduced by over 2/3. The impact of getting caught in losing trades that are all reflective of USD weakness decreases significantly. We’re now trading a mix of AUD, CAD, CHF, EUR, GBP, JPY, NZD, USD and XAG. No one currency should dominate the performance. The system also does extremely well on emerging market currencies. I’m holding off on adding RUB, MXN and others until I determine the impact of the spreads on overall profitability. They’d do amazing if we could trade for free! We’re coming into the summer, which is when the forex market traditionally falls into the doldrums. That’s generally a good thing for QB Pro. The markets whipsaw up and down without really going anywhere. The alternative is that the Fed hikes rates in June and sends the market into a USD buying frenzy. That’s also good news. Most of the money that QB Pro made over the past 8 months was driven by USD strength. A rate hike would unleash chaos in emerging markets and equities. That’s the kind of condition to push volatility into our new crosses, creating opportunities for us to trade. I’m extremely disappointed. After several thousand dollars in programming expenses, and not to mention the 100+ hours that I spent coding myself, the QB Pro 2.0 change is a wash. I had a trusted developer audit my code to make sure I wasn’t doing something stupid like trading on future prices or anything. Neither him nor myself caught anything from December until March. Towards the end of last month, a single line of code ruined it all. One of my key features was deciding when to bail on trades and go the opposite direction. Well, it turned out that I accidentally introduced data snooping into the backtesting platform. I pre-calculated when losing trades occurred to calculate probabilities. What I accidentally coded was “If tomorrow is a big loser, then do the opposite.” If only that were possible! I don’t want to muddle up the explanation with code examples. Suffice it to say that the idea didn’t work out when I took away the ability to look into the future. There are some features of the 2.0 system that I wish to analyze in the coming months, but for now it’s going to have to take a back seat. My plan is to sit tight for a few weeks to ensure that the new pairs are working as intended. Whenever I am personally satisfied with the system behavior, I intend to increase the amount of capital in my account. Don’t hold my feet to the fire. This part is a subjective process, so I can’t put a precise time frame on it. If and when I am satisfied – and it’s going very well the first few days – then I will make a decision about increasing my capital at risk. If and when I choose to increase my capital in the account, I will then re-open QB Pro to new traders. PS: I hope that the drawdowns encourage some of you to withdraw profits the next time the opportunity presents itself. You don’t want to lose more than you are comfortable risking. The first full month with all clients on the system was awesome. The MAM earned $45,199.63 across all client accounts. My company account made $1,247 on a starting balance of $2,500. Remember that you should withdraw anything above your desired risk level out of the account on a monthly basis. I removed $750 from my personal account on Friday. That’s a total withdrawn profit of $4,997.66 on a single deposit of $2,000. The total lifetime profit on the account is $5,997.66. Now that I have two months of risk capital completely set aside, I’m finally at a point where I’m totally comfortable upping the balance at risk. The starting balance for March 2015 is $3,000. Future plans are to risk anywhere from 20-50% of lifetime profits on a monthly basis in order to compound returns without risking a complete wipeout. I’m only doing that because I have $4,000 set aside to recapitalize the account if things go bad. I polled my existing traders and the consensus ranged from leaving the risk level unchanged to dropping the risk by ~25%. I left the leverage unchanged after the poll, but the next week changed my mind. The account equity was around $120,000 at the time (we started the month at $132,749.27). Watching 5 open positions levered 58:1 on an account that size kept me awake at night. The agreement we all made was that this is a high risk account and everyone accepts the very real risk of loss. I never expected to raise that much money (my goal was 40k) and it’s seriously altered my thinking. The performance fees even managing 100k are substantial. Like any intelligent businessman, I intend to do everything in my power to continually earn that business. Translation: I really, really, reaaaaally don’t want to lose your money. The image above represents an out of sample equity curve for the upcoming trading system running a maximum allowed leverage of 7:1. It’s QB Pro 2.0. The chart shows the profit and loss in dollars over a year and a half period. The tests were conducted in a custom backtester that I spent about 40 hours developing. A developer has audited the code looking for flukes to explain the performance – we haven’t been able to disprove the results. We’ve been working on converting the code into MetaTrader 4 for two weeks now. Whenever the code is ready, I’ll launch it in a demo account to confirm identical performance on the same data. I don’t have an ETA on the changes. Trust me when I say it’s a top priority. Assuming all goes well (fingers crossed!) on backtesting and demo trading, then the next step will be to trade it live on very low risk settings. My goal is to keep your accounts alive and healthy until I’m able to roll out the updated system. That’s why I ultimately lowered the leverage in the MAM accounts by 25%. My company accounts also lowered the leverage by 25% – I’m taking the same risks as my traders. The historical risks of blowup on 70:1 leverage are undetectable on a historical basis with version 2.0. That’s compared to the 8.5% monthly risk of blowing up that I told everyone before they started trading QB Pro. Is the expected monthly risk of blowing up 0%? No! Of course not. If a Swiss central bank type of move occurs and you have a leveraged position in the wrong direction, well, it’s lights out for the strategy. No amount of backtesting can guard against that type of loss. One of the forthcoming, key changes to the strategy is that it won’t be purely mean reverting. It should know when to throw in the towel and start trend trading instead of fighting it. This a critical change and will allow me to fully sleep at night. The trading performance won’t be all or nothing. My expectation is that the risk will decrease dramatically while offering traders the same levels of potential returns whenever it’s available. Should I bet the farm? Obviously not. I’ve answered this person’s inquiry and am satisfied that the car is a superfluous asset (it’s just sitting there, so why not sell it?). That said, I get extremely nervous when I get emails like this. I’m asking because I want to sell my car to make money to fund to account. The risk of QB Pro is presently unchanged. It’s lower than I originally quoted because the leverage is lowered, but it’s still very substantial. If you’re thinking about adding money into the account, then please do not add more money than you are willing to lose. That’s true regardless of the trading strategy. If you can’t lose it, then don’t risk it. Period. End of story. If you’ve been thinking about adding money into the account but it’s not pure “punting money”, i.e., it’s more like an investment, then I’d encourage you to hold off until the version 2.0 is available. I feel more comfortable managing those types of funds and would prefer that you hold off until I have something less historically risky to offer. If you have a question on the fees charged in your account, then please email info@quantbar.com. I want to make sure you understand how the fee is calculated if you have any concerns. Remember that your fees are charged based on the account equity from a month end to end basis. The account equity is taken on Jan 31. We made a profit in February, so the fee is the profitable difference between the equity on Feb 27 and Jan 31, assuming it’s above your high watermark. It is not based on the closing trade balance. Because QB Pro had open trades on Jan 31, the balance reports you run in MetaTrader will differ from equity profit you made in February. Again, this is due to the fact that open trades existed on Jan 31. The difference should be relatively minor. If you see a major discrepancy such as 50% of profits or something, then please let me know. I know of one instance where the MAM software didn’t recognize balance changes of a client as deposits, so they were instead marked as profits and he was almost overcharged. If you see an error, I very much want to make it right. I’m dependent on the software’s accuracy and you spotting the discrepancy is the only way it’ll ever be corrected. Disclaimer: Dominari Online Courses Ltd, of which I am the 100% beneficial owner, does not accept US clients under any circumstance.